The annual report on the state of the world’s climate issued by the World Meteorological Organisation warns that record greenhouse gas levels are driving temperatures to increasingly dangerous levels. Despite exceptionally high land and ocean temperatures over the past four years, an acceleration in the rate of sea level rise, a continued reduction in the levels of polar and glacial ice and an increase in extreme weather events, not enough is being done to address the problem. 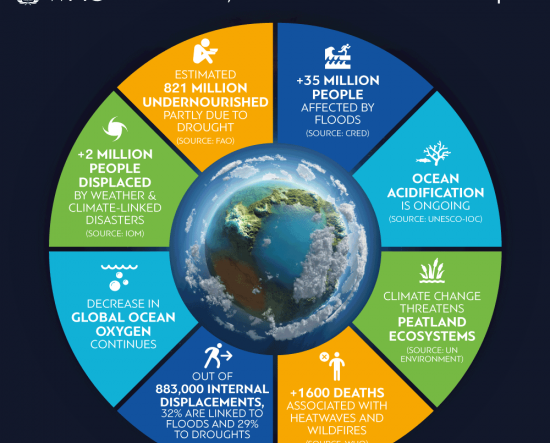 An estimated 62 million people were directly impacted by extreme weather events in 2018, through floods, intense heat waves and wildfires. An estimated additional 821 million people were undernourished due to severe droughts in 2017 while 2 million people were internally displaced due to droughts, storms, hurricanes and cyclones. Environmental impacts include coral bleaching and reduced oxygen levels in the ocean with a resulting severe impacts on marine life. Carbon dioxide levels are continuing to rise (from 357.0 parts per million in 1994 to 405.5 ppm in 2017) and are expected to continue to rise in 2018 and 2019, this despite the recent IPCC report finding that global net human-caused emissions of carbon dioxide need to fall by about 45% from 2010 levels by 2030, reaching net zero around 2050. UN Secretary General António Guterres again emphasised the urgency of action on climate and the importance of the Climate Action summit he is convening in September.